Finally the second issue of FruzNotes is out! This is an online magazine about a world of JVM-technologies. Real people, real stories and real discussions! 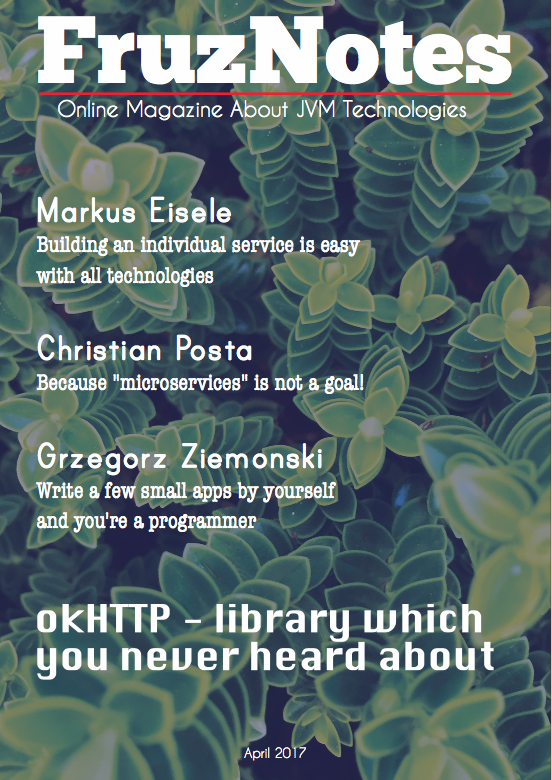 In this release you will find 3 interviews with outstanding programmers: Markus Eisele, Christian Posta and Grzegorz Ziemonski. I was impressed by their experience in a software development. Also we started guest writing for FruzNotes. The first guest is Jesse Wilson! He told us about okHTTP library. What they have in common? All of them are bloggers. And I bet, you haven’t read at least two of these blogs before! Use the form below and download the FruzNotes.